How I Got Rid Of Eye Eczema Around My Eyes and Face. Update: I have found a cream that clears up my eye eczema and has also helped many others. You can purchase it here if you're in the UK, and here if you're in the US or Canada if you don't want to read my whole story and just want to find out what got rid of the eczema. This is a bit of a different post from me today, and is quite a personal one and something I'm really self-conscious and sensitive about. It's going to be very long, and have some really gross photos towards the end. But I hope you'll continue reading, because I hope that someone out there will be able to help me somehow, or will know someone who can help me. I've had eczema for as long as I can remember. There isn't a time where I can't remember having it. When I was younger I would always get it under my knees and in the inside of my elbows, and I had to bathe in E45 emollient. It would usually strike during Autumn and Winter when the heating came on and cold weather arrived, and for some reason when I was a child seawater also flared it up (thankfully I seemed to grow out of this!). Anyway, nothing has ever really worked for it, I've always had to just bear with it and let it run its course until it went down by itself. Although the bath emollient worked, the E45 cream has never worked, and I feel as though I've tried every product out there, from natural to chemical. The only good thing about it being under my knees and in my elbows, was that I could cover it up with clothing, so no one had to see it. When I was 14 I finally found the perfect solution. I was back in Australia for a holiday and we went down to Albany for a week. We visited the Sandalwood Factory down there and I found Mount Romance Damage Control. At the time I was suffering from eczema really badly, and within a few hours of using the Damage Control oil, it was already going down. I also had a huge patch on my left wrist, it was so sore it looked diseased, it was a huge spread of eczema all across my wrist and was so dry it was cracking and bleeding. After a couple of days of applying Damage Control every hour, it had completely disappeared. Then disaster struck. I started getting eczema on my eyelids and under-eye. I couldn't hide this with clothing. It was on show for all to see, and it was humiliating. My eyes were bright red and cracked - it looked as though there was something seriously wrong with me. Despite the Damage Control telling me not to use it on eyes, I did, and it worked. It stung like hell, but it worked. In 2010 I had allergy tests done, and I discovered the reason behind my eczema, I'm allergic to mould. This also explains why my asthma is worse during autumn. Asthma and eczema are connected, and the mould flares them both up. During autumn when the leaves fall off the trees, they decay on the ground and mould spores rise into the air, getting into your lungs and going onto your skin. For those who are allergic, it's a nightmare, and different people have different reactions to it. Back in August 2012 my eczema on my eyes flared up again, but this time the Damage Control didn't work. My trusty saviour for the past seven years failed me, and I needed something else that would work ASAP. Incredibly painful, itchy and completely unsightly, my eyes were red raw with the skin flaking off, and I was waking up with my eyes completely swollen. I spent ages sitting there with a bag of frozen peas on them before leaving for work, and as you can imagine, my tube journeys to work involved me keeping my head down. I felt myself constantly worrying about what people were thinking when they looked at me. The eczema caused both my eyes to swell up. One morning it was so bad I couldn't even see out of my left eye. I hate to think about the amount of money I spent over the course of two months buying and trying new products. I tried every natural remedy in Holland and Barrett, Body Shop, Boots and Superdrug. From Vitamin E to the Body Shop Hemp products, to Caudalie and Aloe Vera gel, and I even went back to trying E45. Eventually I went back to the Doctor and reluctantly agreed to try Hydrocortizone, a steroid that thins the skin. After three days of usage it cleared up. But four days later it was back with a vengeance, and this time the Hydrocortizone didn't work. The skin was so dry it felt like paper, the dry skin flakes were falling onto my eyelashes, and my skin looked weathered and about 50 years old than it is. So I started using the E45 Intensive Recovery for 'very dry skin', and to be honest, it was amazing. I'd been using it regularly on my eyelids for a few days, and they were back to being smooth. But then I read an article on the chemicals inside it the product, and learnt that some of them are actually very toxic. I was furious that the Doctor told me to put this on my EYES of all places! Not only does E45 contain Sodium Sulphate's, but it also contains Propylparaben, which is an irritant that even has links to causing cancer. Please excuse this hideously ugly photo and the super thick eyebrows...I was growing them up to have them waxed and re-shaped :/ But I think this photo shows how bad it truly was - I look really ill and my skin all over my face just looks destroyed and dead. So I was back to square one. I stopped using the E45, and once again I had to find something else that was natural and organic. The problem is I didn't know where to start, which brand to trust, and at the time I honestly couldn't afford to keep spending all this money on products I would use a few times before realizing they were not going to work or were making it worse. Not only was my eye eczema horrible and disgusting to look at, but eczema around the eyes is also incredibly painful. The constant pain and itch stresses me out, and when it's particularly bad I can feel my heart racing from the stress and pain. I also needed to start using completely natural eye make-up, as I discovered all of my normal eye make-up (eyeshadow, eyeliner), are all full of those nasty chemicals that irritate my eczema. But just like with the skincare products, I just couldn't afford to keep buying products unless I know that they'll definitely work. So, I scoured resources online, did A LOT of research, worked with PR companies, and found all of the products that DO work (and those that don't), and I've created lists of them all for you. After testing lots of products, both organic and chemical-based, I found my eye eczema miracle cream. So far it has saved my eyes from eczema, and I have had thousands of messages and comments over the years of other's it has helped with eczema around the eyes and face. I first tried it out shortly after I originally wrote this post in November 2012, and 6 years on, in 2018, I still use it and it still works every time I have an eye eczema flare up. I regularly get emails and comments from people thanking me for recommending this cream, so watch the video below to see if it's something you might want to try, and you can purchase it here if you're in the UK, and from Amazon if you're in the USA or Canada. I've also found lots of natural makeup and skincare products over the past year since I first wrote this post that are great for sensitive skin and eczema. That looks so sore :(. Have you tried Lush's Dream Cream? In Northern Ireland it is in prescription to treat skin conditions. One of my friends has it on her elbow and it helped her out. Lush are always happy to give samples. It really was horrible, so so painful! No I haven't, oh wow, it must be good then if it's in prescription! I'll have a look in town tomorrow :) thank you! And no, never worn glasses - perfect eye-sight :) apart from when they're swollen obvs... lol! I want to THANK YOU so very much for your post. I have exactly the same issue and have spent hundreds of dollars at various doctors offices for the past seven years trying to solve this issue which used to only cause difficulties of my right eye but recently spread into my left. I will be trying your solution products and very excited to have a positive and hopeful outcome. You're an amazing young lady for posting this for others to benefit from. I thank you from the bottom of my heart and wish you only the best for your future especially with your eye health! Can't wait to try! Thank you so much, I really hope the products work for you, please do let me know if they do!! So far they've worked for everyone I've suggested them to, so fingers crossed for you! THANK YOU THANK YOU THANK YOU for this post. Searching how to order these products in the US now. Like you, I've suffered from eczema since childhood (infancy, really) and had to take these terrible "tar baths" as a kid. The eye eczema started about 2.5 years ago and is brutal. The doctor has given me a prescription, but as it's a steroidal ointment, I'm always wary and use it VERY sparingly...I feel like it's just too dangerous. Searching for healthy skin the natural and SAFE way, so I really appreciate your post. Any helpful thoughts on a facial cleanser/moisturizer?? I've been looking for years for something that won't exacerbate the eye eczema...if you've found something, let me know! You can see all of my recommended products by going to the 'eczema' page at the top of this page - where all of the tabs are under the blog name. On there is a list of products I've used and haven't irritated my eczema. If you click on the link to my review on the Dr Organics cream, there are two links to US sites in there. My daughter 10 yr old suffering from same thing. It just started two months ago. One of my friend's son who is just 4, had sever case of this. His dermatologist prescribed Tacrolimus ointment 0.1%. He just used couple of time around eyes and now he is perfectly fine. I m planning to take my daughter to same dermatologist to get this prescription. My daughter's class mate make fun of her, she cries that they call her creepy eyes even though she wears glasses. I pray and wish health for her and for all of u.
Okidokey, will have a look :) thank you so much for all the suggestions! I didn't event think of my diet, I'll ask a nutritionist friend about that! I've read that the tea/coffee that one drinks can cause eczema for the tea can harbor mold as well, you just can't see the mold. Causing an allergic reaction. I don't drink tea or coffee or eat/use anything with them in it as I can't stand the taste or smell of them both, so it wouldn't be that in my case. Yes, I used to live in Australia and when I lived there I hardly ever had any issues with it! Hot weather definitely helps clear it up! I've also heard Argan Oil is good - I'm gonna try it too! Looks painful! I don't personally have eczema, but from everything I've read, I wonder if going completely simple wouldn't be best? By that I mean using something like straight 100% shea or cocoa butter. I would avoid anything with fragrance (like most, if not all, Lush products.) I'd also steer clear of anything with essential oils, unless you can be completely certain they are pure and unadulterated. For makeup, loose mineral makeup is probably as simple as you can get, since almost all pressed makeup contains iffy ingredients to bind it. Again, make sure you are reading ingredients, since not everything labelled as mineral is actually completely mineral. Good luck! Yeh, I'm trying to search for natural products at the moment, but they're really expensive and it's really hard to find products that don't have some sort of chemical in them. I'm slooowwly compiling a list though! Oh you poor thing! I often riuse my eyes with organic rose water and water to take down swelling, puffiness and generally relieve tired eyes. Rose water can also be used neat as a facial moisturiser. So I'm thinking putting some in a spray bottle and spritzing over closed eyes might give you some soothing relief. Also, how about moisturizing with simply oil. Avocado is extra gentle or perhaps soothing calendula oil. Obviously patch test first but then some light dabs with your ring finger might well do the trick. Oooh I've never really thought of rose water before! Do you take an antihistamine tablet just to help with the allergy esp during the winter when it flares up? Also organic coconut oil is a great hydrating agent and it being natural doesn't contain any chemicals. Argan oil is also a good natural moisturiser. The key thing to eczema is to moisturise as much as you can, at least once an hr or two if possible to prevent the skin from drying out too much. Also diet wise, have you tried cutting out milk, eggs, nuts and fish? These are some of the most common triggers so it might be worth seeing whether this helps. I used to suffer badly from eczema so much so that I have scarring on my neck from scratching it so badly when I was younger so I understand how stressful and tiring it is having it. Yeh I take an antihistamine with citirozine in it. A lot of people have suggested Argan Oil so I'll give it a try! Oh my lovely, that looks incredibly painful. I would recommend stripping everything back in terms of skincare and bodycare and definitely going as natural as possible but do avoid anything that has loads of aromatherapy oils in as they can irritate sensitive skin and as yours is already inflamed they might make it worse. In terms of make up, try RMS beauty, available from Content (www.beingcontent.com), it's all pure and organic, based on cold pressed organic coconut oil. I've heard the founder of the brand talk and she is evangelical on the benefits of coconut oil. You can use their coconut cream as a cleanser and moisturiser so that might be worth trying. One person it might also be worth speaking to is Caroline Hirons on twitter (@carolinehirons). What she doesn't know about beauty isn't worth knowing to be honest. Thank you for the suggestions, I'll take a look at those! Seconding the argan oil (patch tested first) and then applied very gently with the ring finger. Probably even more effective after a spritz on closed eyes with pure organic rose water. It's a great natural moisturiser,iinflammation calmer and puffiness taker downer (if you can even say that, but you know what i mean). It's so gentle I often rinse my eyes out with it mixed with water. The simpler the better in my book if you're going to encourage your skin to try and help itself. Really feel for you. Hope you find a solution soon. Oh and calendula oil might also work well. Thank you for the suggestions, will give them a try! Plus the black soap is said to be good for things. Honestly I think it will be a case of trial and error. :/ I have psoriasis so yeah...similar but not the same but usually when i'm not brassic (lol I currently use the superdrug paraben free even though it isn't my first choice of product it is cheap *sigh*) I use the akoma and it is pretty good for my skin. PS. One thing that causes mine to flair up... psoriasis (and I do get eczema on my eyes a little too and other parts) is gluten. :/ Sad times and too much sugar. Ah thank you for the suggestions! I feel your pain! My prone zones are my lips, and weirdly enough, my calves (flared up by shaving!) I've had it so badly in some places that I've got horrible scars from where the skin was so raw and split. Its something that can really knock your confidence and I don't think people who are lucky enough not to suffer from it really understand. I've never really managed to cure mine - I don't think you can, but there are a couple of things that have helped keep mine under control in case you haven't tried them. Aloe Vera in its pure form - I bought a plant, and I snap off the leaves and squeeze out the gel onto my skin. its really cooling so helps with itchyness as well. I've read that drinking aloe vera helps too, if you're brave enough to try it I think holland and barrett do some form of drinkable. The body shop hemp range - really helps it when I get it on my hands. They do a face protector too, so its worth popping into your local and asking for a sample to take away and see how you get on with it before you buy. Also from the body shop - their burti baby butter/lotion. I get loads of people come into my shop with super sensitive skin who swear by this. worth a try? My mum also swears by Aveeno,never tried it myself. I also put plain oats into a stocking/muslin cloth, and elastic band it round a tap and draw myself a bath. the water goes all milky from the oats without any bits. my cousin swears by this to clear it up. It didnt work miracles for me, but it defintely helped to stop my skin from drying out any further. also there is a theory that skin conditions should be cured from the inside - try looking on google for some foods that may help prevent bad flare ups. Sorry for the essay, I really hope you find something that helps you manage your breakouts - and keep us updated on any wonder products you find! I've already tried the body shop hemp range, but it stings like crazy and doesn't really work on my eyes. I've heard of Aveeno - might have to try that! Will definitely look at Aveeno! Thanks! Oooh ok, will try those things! Thank you! Ouch you poor thing. But just before you bin the E45... I'm not certain why you think your doctor is out to kill you? I presume you're not a chemist by background. The internet is a dangerous tool. Sodium Sulphate is - if ingested in quantity - a laxative! Otherwise it's pretty inert (unless you happen to work in a factory where they make it and inhale the dust in which case it may irritate the lungs; but you don't get near the dust if you're using E45). Stick to the E45; it works! Hii, no I'm not chemist by background, but my Dad is and I have a few friends who are doctors. I stumbled across this post via a retweet, I clicked through as I had the exact same issue although weirdly only in one eye. I stripped back my skincare to the absolute basics (think washing with e45 basic ingredient only, name escapes me right now sorry! )cleared out all of my make up in case there was something I was allergic too or it was contaminated (desperate measures) and wore no make up for at least a week. I tried all the natural products and the only thing that helped was trying a different version of the steroid cream, so I would definitely say go back to your dr/nurse tell them whatever they have prescribed isn't working and to try something else. I know it's scary putting those creams on your face but as long as you only use a tiny amount and for no more than 5 days in a row it's fine, and miles better than the eczema continuing. I'm struggling with this exact same thing, although mine was caused by putting an eye cream around my eyes that I shouldn't have and it hasn't gone away since. I have good days and then I have bad days. It seems that if I don't do anything, the itching stops, but it still feels like sandpaper dry around my eyes and I can't moisturize it without it flaring up again because I haven't found anything that I can put on it. So I look about 80 years old with all the wrinkles that form underneath my eyes! I also get eczema inside my elbows and behind the knees as well and have had it all my life, so I know what you mean. I don't wear make-up either. I hope you find something to solve yours! Ooww :( I know exactly what you mean about it feeling like sandpaper! It's horrid isn't it. I had all the wrinkles underneath as well. Wow you guys have had it rough. I went through a rough moment because of an evil eye cream. CAMOMILE soap! The tea is to help relax... I have skin that tends towards being red. My acne cleared with oatmeal soap and have been using that ever since (washing in the morning and at night) But then came the eye cream and a lady at a shop recomended the soap... I can't tell you a brand cause I'm in Ecuador and it's hand crafted not comercial soap. Nonetheless, I washed for three days with that soap and covered the area around my eyes with a thin layer of petroleum jelly. I know, petroleum jelly isn't a good thingin the long run, but for short term, it helped. I slept three days with that and then... I moisturize with almond milk... have you tried almond milk??? Ok, so... one part of my eczema and respiratory problems ended by changing laundry detergent and.... cleaning my work area with alcohol instead of detergents... i did the same at home and my allergies stopped. First, a lot of it cleared up by using oatmeal soap. Washing in the mornings and nights. So the acne and sores were basically gone... Simple, super simple! And I turned to that after spending loads on all these useless skin products. One day I tried an eye cream for tiny wrinkles, and it messed up the skin around my eyes! Eczema was back, the skin was red, sore, cracked and puffed. She suggested it for my red skin (rosacea skin). So I went for it. Camomile soap for my face and almond milk to hydrate. My skin is doing great. I can't recomend brands because these are all locally hand crafted products in Ecuador. Yet these products (100% natural) are available on amazon. After trying many different creams and other things the only thing I've found to worked is Aveeno active naturals daily moisturizing lotion with natural colloidal oatmeal. I put it on every night before bed. I'm not sure how good it is to be using (i kind of assumed it was better than steroids) but it helps me. I don't think we'll ever find something more than temporary relief to be honest, as there's no cure. But having a moisturiser you can use daily on your eyes like any other moisturiser is better than a steroid cream or E45! The Dr Organics Manuka Honey Rescue Cream directions say: "Avoid contact with eyes. Do not apply to broken or irritated skin." I too have the dark spots around my eyes now and the steroids given to me by the dermatologist have made more damage than good and burn like hell! I ordered some Dr Organics Manuka Honey Rescue Cream today and even paid for overnight shipping. I am desperate. The itching and pain is indescribable!!! Directions: Apply liberally, as and when required. Other Ingredients: Aloe barbadensis leaf juice, Water, Cetearyl alcohol, Glycerin, Cetearyl glucoside, Borago officinalis seed oil, Beeswax, Prunus amygdalus dulcis (sweet almond) oil, Brassica campestris (rapeseed) sterols, Zinc oxide, Rosa moschata seed oil, Honey extract (Manuka honey), Theobroma cacao (cocoa) seed butter, Sodium hyaluronate, Glycyrrhetinic acid, Glyceryl caprylate, Tocopheryl acetate, Sodium phytate, Xanthan gum, Fragrance, Sodium benzoate, Potassium sorbate, Citric acid. WARNING: Not for internal use. Avoid contact with eyes. Do not apply to broken or irritated skin. If sensitivity occurs discontinue use. Avoid this product if you are allergic or sensitive to any of the ingredients. Keep out of reach of children. Do not use on animals. Store in a cool dry place. What it means is don't use it on your eyes as in on the eye ball... Dr Organics themselves sent me the product knowing exactly where I needed to apply it, and they said it's fine to use it on the eyelid and under eye. Hope it helps, please do let me know if it does! I have had eczema my whole life too. I feel your pain. Its 50% physical pain and 50% psychological pain. Thank you for sharing, its nice to know i'm not alone. I find vegan products work best. thecrueltyfreeshop.com.au have a small range of beauty and skin care products. Avoda from Myer is vegan and their skin creams are ranked my number 1 best. Say no carrots have a really good skin cream. I moisturize every day and for flare ups I apply tropical cortisone, with a shower oil. However none of those are vegan. If all else fails I take oral cortisone. Which is like a miracle drug. But the worst for your health. That's interesting your allergic to mold. I'm allergic to dust mites and dander. Not sure if this is a duplicate. Your eyes look like mine and I have a severe allergy to dust mites. Be relentless about pillows especially. Hii, yeh I tried coconut oil - no luck sadly :( I've found three products that do work for me though, so I'll do an update post soon! Hii, you can only get it from Holland and Barrett, either online or in store. I guess I'm lucky in the fact that my eczema disappeared after changing my laundry detergent and a week or so of using Salcura's Dermaspray. However, I do understand how debilitating it can be. P.S. The Dermaspray can be used on a cotton pad around the eyes. It's so soothing and breaks that itch-scratch cycle. Works great when paired with coconut oil or Moa Green Balm. Hi really enjoyed reading your blog as I also suffer with eczma around the eyes. I am looking into buying the dr organic cream you suggested. The thing that gets me down the most I is that I have lines in the corners of my eyes that go downwards a bit similar to yours in the photo. Does the cream help at all with this. I have only suffered with these lines since having the eczma. Well... Steroid creams, such as that hydrocortisone and others, also have links to cancer. You should not worry about it, because it is only for prolonged use. So I was reading through eczema blogs and I came across your personal story. I've also suffered from eye eczema on both of my eyes for a very long time and I get the kind of itch that makes your wanna rub your eyes until they are raw. I was using protopic (immunosupressant drug that does NOT thin the skin (get might give you cancer down the road) to manage it, but it never got better for longer than a few days before I had to reapply. I'm was so fed up with eczema that I wanted to take matters into my own hands and I started seeing a naturopathic doctor as apposed to my derm or family doctor that only recommends either toxic creams (with petroleum) or steroids to manage my eczema flare ups. SO I went completely cold turkey and severely changed my diet. No creams (aside from a light mosturizer with NO toxic elements called Patrick Curelle) and a brown rice elimination diet (basically no gluten, dairy, or soy and lots of vegetables and organic proteins i.e. wild salmon & organic chicken or turkey), which systematically doing food and environmental allergy testing through blood work and skin prick tests. At first, I had the worst flare up ever for the first week. Then complete clarity after week two and another lesser flare up here in week three. However, this whole time despite my body having flares, my eyes have NEVER itched. I haven't even need to touch my eyes. I am a big believer that eczema can be cured through diet that can be used to heal the gut and then food avoidance from allergenic foods to prevent future flare ups. It takes tons of dedication and a few epsom salt baths, but I am mentally better than I have been in a very long time. My skin is still healing but my itch is virtually gone. If you're interested in all this stuff, just google elimination diet, detoxification, and healing crisis. I'm on the road to being eczema free forever and I hope that this information can benefit you too. I am so glad I came across this. I am from the States but currently living in China. I noticed my eye eczema starting about 3 weeks ago when I spent a weekend in Hong Kong. At first I thought it was just dry skin so I put a lot of different over-the-counter lotions on it and nothing worked... Then last week, I was working in Vietnam and I woke up with my eyelids completely swollen - I could barely even open them. I went to a doctor immediately and was hooked up to an IV of steroids. The doctor also prescribed me steroids and antihistamines. 2 days later, the puffiness went away but the dry skin was still pretty apparent (and beyond embarrassing!)... So I looked up online some hydrating creams and I came across one from Crabtree & Evelyn called La Source. I've only been using it for 4 days but my skin is significantly better! I hope that this really makes a difference. I can't bear to spend another day in an Asian hospital! Any updates on good skin creams or cures for this would be awesome! And Catherine - THANK YOU for posting this! Aw no worries, if my post helps other people then it was worth the humiliation of posting those photos for the world to see! I know this is really late, but I also have some bad eczema around my eyes, the thing that I found to lessen the redness, and dryness of it is an aloe based ointment/gel, called vespera by a skin company called exuviance, even after it went away my skin was left looking younger, and more radiant. My dermatologist was even surprised to see that it was gone, however I know skin can be tricky, and not everything works for everyone, but I do hope this helps. Good Luck! Great to read your post. I found it while googling eczema around eyes. Similar to you my daughter had very severe eczema on all wrists elbows etc. I had to bandage her from shoulder to wrist at night. Allergy testing revealed her food intolerances and we mostly cleared it up. Now out of the blue she has developed facial eczema around the eyes and hairline. It stings when I try creams and her usual 'go to' creams don't work. I'm almost wondering if this is a different intolerance. Frustratingly all doctors want to prescribe steroid cream. i absolutely refuse. My daughter is of mixed ethnicity and I have found in the past it actually lightens her skin! I'm sure you know but EVERYONE you speak to has the golden miracle cure. I have come to the point where i think different creams work for different people now as out of the 50+ I have tried only a couple (read 2!) have worked. The Mario Badescu range is something I use immediately to bring down the redness and it seems to be working until I find what her trigger seems to be. Did you consider the possibility that you might have scabies mites? It strikes under the knees as you mentioned, and is very hard to get rid of. And did you consider it could be a yeast or bacterial infection? Haha, yeh it definitely isn't mites. I haven't had it under my knees since I was little and the doctor diagnosed that as eczema. It's now just on my eyes, and definitely not an infection. The doctor again diagnosed it as eczema. So I'm pretty sure it's all eczema. Thanks so much for your comment, it's comments like yours that reassure me I made the right decision in posting about my own experiences wit eye eczema. I cannot thank you enough for this blog post. After spending over $100 on creams trying to clear up my sons eye eczema, I decided to do my own research. I came across your blog, and decided to give Dr Organic Manuka Honey Repair Cream a go. WOW! After a week and a half of continuous use, it's completely gone! I've had the exact same problem recently, and I know exactly how you were feeling. Funnily enough, I'd tried almost everything I could find like emu oil and jojoba oil and they worked a little...but Lucas' Paw Paw ointment is what I've been using for the past two days simply because it's cheap and easy to carry around, and it's working!!! But if it doesn't keep it down, I will definitely try the manuka stuff you suggested :) Thanks heaps for this post! Thanks for your comment, definitely try the Manuka Honey, it's amazing. Be careful with Lucas Paw Paw, I used to use it religiously on my lips, then discovered it has Paraffinium in it (petrol!). The Paraffin in it actually dries out the skin in the long term, so will do more harm than good even though it gives short-term relief. Doesn't it just help so much to know that other people suffer the same? It may be a bit shallow to think that way but it's more about knowing that you're not alone and we need that as people. I enjoyed your post and thought it was actually pretty cool of you to post about your skin concerns. For women, we place so much emphasis on our looks (our societies teach us that really well, don't they!?) and it's very debilitating to feel that this is affected and well before the aging process which is only natural and understandable!Go you on addressing it and treating it like it's just "another" thing you're dealing with and not something you have to hide. I'll try that cream for sure. Take care. Thanks for your comment, I know what you mean, it's honestly been such a comfort receiving so many comments from people with the same issue. Just KNOWING that you're not the only one is such a relief, even though it's horrible! It's definitely a horrible thing having something that affects how you look, thankfully my eyes are almost always normal now thanks to the Manuka Honey Cream and changes I've made with beauty products. It was so depressing having to walk around with dry & swollen eyes, absolutely horrible. It took me a long time to think about whether I should post about my experiences, but I'm glad I did now. Are there any substitutes for this cream and how did you get rid of the red skin around eyes? Hey I struggle with the same thing and I was just wondering if you've found a product that works yet? For a while I was using the Burt's Bee's Royal Jelly but that seems to have stopped working now, and I really can't afford to keep buying products that aren't going to work longterm. I also struggle with eczema and I feel very insecure about it. I just started getting it on my face and been using cetaphil face wash and cream which is natural and non fragrant... I think my eczema flared up because I'm stressed about going back to school. I would like to know if there has been any real product that worked for you. Hi I have been suffering with dermatitis since I was ten all over my body im now 29. Like you I have tried everything from creams to specialists but the doctor said it is a lifelong problem and can only be controlled with steroid ointments such as advantan and aristocourt creams. But they are very bad for your skin and I started to get it around my eyes my doctor said to use advantan cream because it was so bad.Although it worked for the moment It thinned out my skin and has left permanent red blotches under my eyes! looks like im tired all the time:( So I definitely should not have used it. I wish I had explored other options but at the time was willing to try anything to get rid of it not realising the outcome the steroid cream would have on my skin:(. I still suffer with it around and under my eyes and am egar to try the dr organics Manuka Honey Rescue cream. Can you buy it in Australia in any retail outlets that you know of or only online?. Because I don't feel safe buying online as my aunt was robbed of all her savings buying online. Please let me know if you know of somewhere I can buy it I would greatly appreciate it. And thanks so much for your story it gives people hope that there is a way to cure these terrible skin conditions! thanks again simone:). I can't offer anything in your country since i'm in Ecuador but for the staining I can recommend creams based on Concha Nacar. Basically, it's the product inside sea shells that covers pearls and turns them white... There must be something in your country that is made out of this and it is a natural skin stain remover... it's part of ancient roots out here. Have you ever heard of anyone without allergies, asthma, or excema having this eye issue? Hi, I have the exact same eye problem, I would love to show u pics, bc mine looks just like yours. I have never had allergies or skin problems & still don't except for the eye issue. Your blog made me feel like I wasn't alone, so thank you. I'm going to try your solution that is working bc nothing I have tried has worked. Thank you for posting this, i feel relieved knowing i was not the only one. I have suffered with eye eczema and neck eczema which is painful, red, swollen, itchy and flaky since 2009. It has even spread to my breasts! It is awful. I am seeing a holistic doctor as my final straw and she has suggested using the manuka honey as well! Argan Oil and all Eczema products did NOT work, and in fact made it worse. I tried coconut oil, vitamin e oil, vaseline, steroid creams, hydrocortisone creams, and even oral steroids but the eczema would always come back. I am ALSO highly allergic to mold and did not know that about the fall time. THANK YOU for explaining that. My holistic doctor has also put me on a hypoallergenic diet (google it you will find a diet plan) to rule out food senstitivies. I have tested negative for food ALLERGIES but she believes that eczema is also related to being sensitive to food. If we eat the same food every day or atleast 3 times a week or more, our bodies build up antibodies for it and then we actually start to react to it. It has really helped! My eyes have gone noticeably down in just a few days of cutting out dairy so I might be sensitive to that. Also (as you said) gluten and sugar can flare it up as well. You just have to eliminate numerous foods for about 2-3 weeks and THEN reintroduce them. IT IS WORTH IT. Eczema is really an unexpainable condition most of the time, so we have to realize that our bodies truly react to what we put in them. Putting creams on it everyday only puts a band aid on the root of the problem...sometimes we need to start with changing our bodily habits before we see a true difference. GOOD LUCK! I too have suffered with this - you photos remind me of my eyelids a couple of years ago. It can really affect self esteem and the feeling that you might not be able to find what causes it or a way to make it better can bring you down. It took some time for me to get it under control, and going to work in a public facing job was soul crushing. I found it was always wise to be very careful about what went on my eyelids, particularly some moisturizers the doctor would give you can make it 10 x worse. I must have spent over £100 on various creams, but one thing I found that helped was Lid Care sterile wipes from a company called Alcon. They come in packs of 20 individually wrapped wipes and are quite portable so I could use them regularly when out and about. (I don't work for this company BTW!) I think they were key in stopping the eyes getting infected, which they were prone to do when with the eczema on the eyelids. They don't cure it but they gave the skin a chance to heal in conjunction with the weak topical steroid cream prescribed by the Dr. Thanks for your post, your description of your experience really resonates with me and I'm sure the many other people who have suffered similar situations. Although every case of eczema is unique and we have to find our own cures there is a lot of value in reading about others experiences especially psychologically! Hi, I have recently started to suffer with what I think is eczema around my eyes following on Blepharitis, I tried everything, steroid cream, which I really don't want to use, various creams, chnages to my cleansing routine, I have now switched to Liz Earle face care and the Manuka honey cream you suggest near to my eyes, and they are now definitely on the mend, thanks for the info regarding the cream, it's doing the trick! Hi there, I can really relate to your blog post. I had eczema on my inner elbows as a child and I eventually grew out of it. I am now 25 and have been suffering for the past 3 years with eczema around my eyes, on my lips and around my mouth (also on one finger). It runs in the family as my sister and uncle suffer from similar issues. The lips are especially terrible because anything I eat or drink irritates it. I have been using Protopic ointment of tacrolimus 0.1% (stronger than cortisone) as it was prescribed by a dermatologist, but I've read that it causes cancer after prolonged use. It is also very strong for delicate facial skin and burns like crazy for a few hours before it eventually clears the skin. My eczema is related to allergies too. I suspect they are mostly food allergies (seafood, stone fruit like peaches and plums, spicy food, MSG, eating excessive sweets). I also feel that my eczema is worst the day after drinking alcohol. I have an appointment with an allergist to figure out what my triggers are. Environmental and immune system related things trigger it as well: stress, lack of sleep, cold weather, dry air, etc. 3) Clear Glow Nettle Combo Tincture, St Francis Herb Farm: drops that you mix with water and drink. It is supposed to be a cure for eczema, psoriasis and acne. It clears the stomach and liver of toxins that are responsible for skin problems. I just tried it for the first time, and my stomach is rumbling and making strange noises. Fingers crossed to see if it works. - for the lips: Nuxe rêve de miel chapstick for daily use (after trying at least 30 different chapsticks), and l'Occitane en Provence shea butter lip balm in liquid tube form, acts as a lubricant when it is really irritated. I also recently started doing acupuncture. I've been 3 times and I don't see any improvement, although it is supposed to take a while to see results. Does anyone have any experience with acupuncture helping eczema? I was hoping for some placebo effect but none so far. I have also spent a lot of time and money buying new products that have either not worked or made it worst. I'm really glad I found this blog post - it's helpful to read other people's experiences and suggestions. My husband is a long term eczema sufferer. It's an ongoing battle to keep it under control and what works for a while often ceases to do so and then is sometimes effective again down the track. The homeopathic remedy available at http://gentlyheal.com has worked well for him for quite some time. Worth adding to your arsenal. My husband has the same problem on his eyes and it's never been identified as eczema, they refer to it as dermatitis which is quite a vague term. I typed in eye eczema and found your blog. Thank you for sharing this Dr. Organic creme, I'm actually familiar with it. Thank you for this post - my little girl (6 years) is suffering around her eyes like your photos. She has started getting teased at school and i have been feeling like i'm failing her as not able to find anything so far to help. Will investigate your recommendation thank you so much for sharing! Thank you. Thank you for sharing your feelings and your photos! I was begging to think I was crazy and that something was really wrong with me. I too have had eczema on my arms in the past and about 3 years ago it started appearing on my face around my eyes. It makes me feel like a monster. I just started a new job and instead of excitement I feel shame for walking around with this all over. I cannot begin to tell you just how much reading your words has helped. I am going to try the cream you suggested, and even if it doesn't work I'm still comforted knowing that it's not just me. This post has helped me immensely. 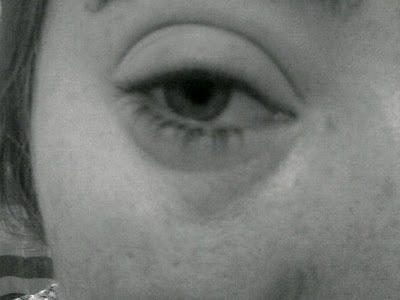 I am currently struggling with eczema around my eyes too, the swelling is so awful and the skin is all wrinkled too. It completely changes the shape of my eyes as well as making them feel heavy and hard to open all through the day. I will be buying your recommended product ASAP. I cannot wait. Thankyou so much for sharing your story, you aren't alone! Where do most of you live? I'm in the States and I don't think I can buy or even have this product shipped here. I am kicking myself because I was just recently in northern Scotland on vacation and could have looked in Glasgow. The little pharmacies in the north didn't have it but I forgot to look the one night we were in the city. Does anyone think it might be similar to Burt's Bees Royal Eye Jelly? I am still looking for a systemic connection to lessen the outbreaks in the first place. It was much much better the three weeks we were in Europe. Hi, if you click the link to the post about the product, there's a link in that post to the Vitamin World site which is a US site that stocks the product. Puritan's Pride also stock it. How did I miss that before??!! Thank you so much this is like a support group for eczema. Haha no worries at all :) aw, well I'm just glad I've been able to help so many people - I had no idea so many people suffered the same as me, I used to feel so alone! My little jar of eye cream just arrived! While I realize different products help people's skin differently, I have to say from first feel, this product is very very different than anything I have seen or used so far so if anyone hasn't tried it yet, it's worth a try, even w shipping it wasn't expensive (15USD). I will report back as I have used it for several days or a week. Oh my gosh I thought I was the only one! I've never met anyone else with eye eczema the way I have it. To everyone: SERIOUSLY CHECK INTO YOUR DIET. Actually try and stick to a cleanse and elimination diet to find your triggers. Food "allergy" tests are not always accurate. My major triggers are refined sugar and flour (gluten) and possibly eggs... still testing eggs. But I have met several people with body excema and acne that have cut out eggs and been cured. You'd be surprised... eggs and their proteins are in EVERYTHING. I'm checking back in here with an update. After buying the Manuka Cream back in November I felt at first it was helping. It had a lovely feel and smell. But alas my eyes and really anywhere in my upper torso, neck, forearms have been in serious flare up for months with no relief. Last week I decided to decrease sugar and eggs and at the same time I bought a lotion called CeraVe which no one on here has mentioned. It's over the counter in the US and $12. Two eczema suffering friends recommended it and my primary care doctor. My dermatologist has never mentioned this instead hanging her hat on Vanicream which doesn't work and ultimately leads to clogged pores and infected cysts for me which then sends me to the doctor or emergency room for lancing and antibiotics which then cause other problems. See the cascading effects of stupid eczema? In one short week my eczema is virtually gone using this simple lotion!!! You folks can appreciate that relief. I was at the end of my rope. I believe I need to work on my food triggers and I'm doing that with an elimination diet, but in the interim I FINALLY have a topical that isn't a steroid and doesn't cost a bundle or require a Rx and is working simply & effectively. CeraVe - try it! It contains ceramides which are essential to our epidermis layer yet missing in those of us who are eczema sufferers. It is time released and therefore you don't have to keep reapplying - it really works. I have my life back!! Ow I'm so sorry it didn't work for you :( but YAY you found something that does work! I'm off to google CeraVe now, but I'm not sure we have it here in the UK. Hehe, well I use an affiliate site called Skimlinks, so I can track how much the company make through my blog, and then I get about 5% commission from that :) 5% isn't a lot of money really, but I then put that money back into the blog through giveaways and things. OMG. I though I was the only one that had this. Mine is flaring up at the moment. I just don't know what to do anymore. I don't really want to use the Hydrocortisone cream anymore. Plus you're not really supposed to use it on the eyes. But, it is the only thing that will help the slightest bit. I've tried every eye cream from the Body Shop, I have tried various things from Dr Organic too. So, I may actually splash out on Elizabeth Arden Fragrance Free 8 hour cream, seeing as I have read a few other eye eczema sufferers saying it works. We shall see. And in terms of eye make up. The only eye make up I can use at the moment is ELF's Mineral Eyeshadows. Your eczema is bad, and hope you can overcome it soon! I am so glad I found you, it's such a relief! Since November, I've been waking up with really swollen eyes, and dry, burning face. But two times, it has been the absolute worst. I am going to an allergist soon, but now I know it's the eye eczema that is causing it. I've ordered First Aid Beauty (a.k.a FAB) from Sephora, and it's all natural without any harsh chemical. It has a cooling affect when applied, but I am going to see if they have anything for the eyes, also my doctor recommended Aveeno Daily Moisturiser. Hope you find a natural cure, and I will be on the look out too, and if I find it anything I will inform you too! Hi - it too have this problem and its particularly bad at the moment- my right eye swelling so much i had no peripheral vision! I too have been using e45 cream and it only had a little effect- my gp believed i had an eye infection and prescribed anti-biotics slwhich seemed to help- however they have flared up over the weekend! I had to go eye casualty today as they were quite bed red raw akin to a burn almost! Im a mere novice to this problem- however I feel that my body is not built for cold weather! Please can you provide me with some tips - as im walking around with an absolutely horrible face. The strange thing is that my eyes look exactly the same as yours however i have not suffered with ezcema before- just a little in the folds of my arms! I've also suffered from facial eczema around my eyes and on my upper lip since I was a pre-teen. I've tried almost everything and 80% of the time it just makes matters worse. Another thing that helped was doing a cosmetic allergy test. I found out that I'm allergic to a common ingredient in shampoo and also something called colophony which comes from pine trees and is often used in mascara and eye shadow. A word of caution - natural plant-based products aren't always best as they can be allergens as well. I still have issues - we just turned the heat on for the winter and I have flared up pretty badly which is how I found this blog post, but for the most part knowing what my 'safe' products are have helped a lot with how often this happens. I want to thank you as well for sharing and I'm definitely going to try the Dr Organic cream. Thank you so much for your post. My eyes hafe flared up once a month. It has developed onto my neck and arms. Im going to Holland and Barrett tomorrow to get the cream. I know exactly what you went through. Thank you. Thankyou so much for your post. I have been suffering really bad eye eczema and have always used organic skincare and make-up. My diet hasn't changed in any way but I have now cut out dairy to see a difference. My usual skin saviours aren't soothing or getting rid of my eczema. As you have described how painful it is and flaky and hard to open eyes and see properly. I need an allergy test for sure but give your recommended products a go. I have read all the comments and feel for anyone with the eyelid eczema or any eczema. I have used Dr Organics Manuka Honey Rescue Cream for comfort care for my flare ups and it works for that but is normally never a cure. I have eczema flareups on my eyelids, outer nostril area and outer ear areas and the severity is always on the eyelids creating huge discomfort and is not great for pictures. I sought out a dermatologist in Winnipeg, Manitoba, Canada and was very successful in providing me with the prescription for PROTOPIC ointment (no steroids in it). This product gets my flareups under control and I can live a normal life. After the use of the ointment, my sensitive skin eczema is controlled after a couple of days. There is usually a stimulus that creates the eczema for me and it is the change of seasons from summer to winter when the humidity levels drop in indoor areas for heating purposes. I know this because I leave Canada and go on vacation to the tropics and my eczema rash goes away and upon return it flares up. Addressing the flare ups in a timely manner helps me with the use of the Protopic ointment and I use it for a few days until it is under control. Once under control I do not need to use the ointment as maintenance and only for flare ups. I had a similar eczema behind my knees and suffered for many years. I finally tried a steroid ointment behind my knees and it was resolved in 3 days and has never returned. For me it is humidity that triggers the eczema. For others it is molds or allergies. Whatever the trigger is for flare ups it is key to get it under control as soon as possible. I have tried numerous cremes and homeopathic solutions without resolve but spent lots on the pursuit of a cure (or comfort) and I have found that there is no cure but I have to address the flare ups or move to the tropics. I love Canada too much to move but do enjoy tropical vacations. Cheers and Good Luck with any flare ups. Thanks so much for commenting and sharing your story. I agree completely, mine flares up in the winter too - I live in the UK. When I lived in Australia I never had any eczema issues! Sorry the cream didn't work for you, however there is no cure for eczema. No cream can completely cure eczema, nothing can, you will always get flare ups no matter what you use. For me I use the Dr Organics cream to just cure the dryness and soothe my skin. It is interesting how different climates affect different people. I live in the northeast of the US in Maine where it's somewhat dry and usually cold in the winter and typically until two autumns ago my eczema was only present in the winter. Then that changed and I suffered flare ups starting in October 2012. We went to Hawaii (Kauai) last January and my eczema was horrible while there so warm humid climate didn't work for me either. That's why I am pursuing the food inflammation angle so strongly now as I feel that is the source for flare ups. Thanks for your reply. I too will continue to use the Dr Organics cream as the product provides comfort at numerous levels and I have no concerns of where I apply it or how often I apply it for dryness. It is a great product and I cherish it very much. I just wish there was a distributor in Canada to pick it up. For now, I order it online from the US for delivery to Canada. My eyes look just like yours at the moment and i have been going crazy from the pain and itchiness, bot to mention the wrinkles and ugliness. I'm off to buy some Dr Organics in the hope i get some relief too. Thanks so much for your post. I thought i was the only one with ezcema on her EYES for heavens sake. I get the same also set off by mould. When it's really bad then there's a great medical cream called pimecrolimus branded as Elidel which can help get it under control. Unlike hydrocortisone it's not a steroid and so doesn't have the same skin-thinning effects. For that reason it's specifically used for the eyes. But then I'm also on the look out for a good moisturiser which helps them back to health - so many make my eyes sting and flare up again. I'll give the honey cream a go. Euan, you must have a prescription plan or live somewhere outside the US, Elidel is prohibitively expensive, I have Protopic which works pretty well bought when I had prescription coverage. Anyhow, I have been working on an elimination diet - and have finally found one big trigger: eggs. Not news really as they are a known inflammatory but I now know they are off my list for now. I do think going through food testing is valuable - at the moment I am about 98% eczema free. Thank you soooo much for this post. I have exactly the same symptoms and I was suspecting I'm allergic to mould for a longer while. My itchy eyes and eczema has started when I moved to UK, we have changed flat recently (from London to Brighton) but all of the symptoms persists and doctors prescribe steroid creams every time. I decided to give a try to Dr Organic Manuka Honey Rescue Cream you have mentioned... I got it in Holland & Barret. It is still to early to say for sure but it looks like it works also for me, haven't applied steroids, only the honey cream and skin around my eyes feels much better. Thank you!!! Try it out. Affordable and effective. Great lotion. I posted above about CeraVe which I find is working better than restoraderm for me. Jackie I had a blood test last year through a naturopath to identify food sensitivities, it was expensive and didn't seem to really rid me of eczema after avoiding the long list of items. Your derm can do a test for chemical allergies but I feel firmly mine is systemic so I am doing an elimination diet called The Plan and am finding out inflammatory triggers of the usual suspects : eggs, dairy, tomatoes, sugar etc. you have to be diligent and truly introduce one item at a time back but eczema responds quickly so it's possible to identify the problems. THANK YOU!!! I bought the Doctor Organic cream for my eyes/face and within 2 days it's completely gone. I hate using the prescriptions and they are costly. This is great cream for the entire face and feels soooo goood!!!! So glad I found your blog!!! I also look for something out there to get rid of my eye excema or should I say blepharitis or allergy or alltogether.My flare-ups are not too drastic but my skin is constantly inflamed, sometimes more sometimes less. It is definetely worsening up some 10 days beore my period so recently i thought it could be hormonala as well./ condition called autoimmune progesterone dermatitis..../O my God .I sometimes think that i am not having any progresses and that I am still stuck with diagnosis.Unfortunately doctors I see are very superficial and it usually ends u by giving some antibiotics andd steroids.I am sick and tired of drugs...I need to go to the root of the problem. If there is someone out there who have experinces with dep lines under eyes, I ask you kindly to write 2 line which may save me! Also thank you to all others who wrote here too. Cream is good but doesnt eliminate inflammation, it only reduces it in my case.I have started using it 2 days before my period when I usually get flare ups...Now three days after I started applying it twice a day heavily around my eyes I can say that I would definetely buy this product again as it is natural, it feeds and protect the skin much better than the others...Price is also very good...Unfortunately I have to go back to immune system and cause itself...Vicious circle!! After struggling with this since January it has made my day to come across your blog! Although, things have cleared up over the last 4 weeks, i'm still suffering from wrinkles in the very corners of my under eyes. Having said that... I'm so happy that it's cleared up for now. Now fingers crossed to keeping it at bay! I've found using any moisturiser on my eyes causes my skin to become thin, red and wrinkled so for now i'm just sticking to a twice daily facial wash with cool water! Thank you for posting this, glad to know i'm not the only twenty something year old that's had this! Thanks for the tip - will give it a try. You look fantastic by the way. I have had problems with eyes since my twenties and I am 40 now.I wish you desrcibed better your symptoms but anyhow I suggest you to go to the ophtamologist and asked him to check your eyes for blepharitis,It is eyelid inflammation.Also test your eyes for presenceof bacteria.If there is staphiloccocus aureus there, it is very likely you have this condition.I thought i had an excema because I was misdiagnosed by many doctors,Things started to improve when i started reading articles and forums online and getting as much information as possible. In order yourself you must be sure what is causing it and what is possible diagnosis.. I also buy Dr Organic manuka honey cream and it is good but I would rather wait with the purchase and spend some time understanding whats going on.. Please explain better your symptoms..
Hi Catherine! Thank you for writing this awesome blog! My eyes currently look much worse than yours! I unfortunately had no luck with Dr Organics Manuka Honey Cream! I drove 2 hours from Canada south to the US to buy it, and I actually had an adverse reaction. The morning after I put it on my eyes they were even more red and pouffy! Not for everyone, I suppose. Oh no! :( Did you put it near the inside of your eye? If it got into the actual eye that could have caused swelling/puffiness. I did that at first, realized what I'd done as the inside of my eye was stinging, so was just careful after that and after a few days of using it my eczema was gone. It doesn't clear up within a coupla days, you really do have to use it for 4-5 days. Have you eliminated possibility of Blepharitis.I was misdiagnosed for years...Check your eyes for bacteria and get specialised stuff for eyelid hygiene...eye make up can have such effect on eyes.. Sorry for not responding to your earlier comments from a couple of days ago, I was in Italy and got back late last night so have only just had a chance. In regards to your earlier comment, I believe I did explain my symptoms clearly..."Incredibly painful, itchy and completely unsightly, my eyes were red raw with the skin flaking off, and I was waking up with my eyes completely swollen." I'm not sure I can get clearer than that? I have been tested for many things over the years as I've suffered since I was a child, and as stated in the blog post, it is eczema. I've seen countless doctors and all have diagnosed as eczema caused by an allergy to mould. The mould allergy flares up my eczema and asthma, and of course chemicals in makeup and skincare products don't help, which is why for the past 18 months I've been using only natural products instead. I was tested for Belpharitis a while ago and they said it wasn't that, I even managed to get a special eyelid shampoo from the optometrist as I was insistent that I wanted to try it just in case, and sadly it didn't work and actually irritated them and made it worse. purity..i have to stop using my mobile phone when i reply to people..
first of all thank you. I have been wondering what the hell has been wrong with my eye but looking at your pictures it's pretty clear. I have had sporadic eczema outbreaks in the past but it comes and goes as it please and I never made the connection. I'll pop out and get that cream tonight. i just wanted to thank you for posting this on your page, my eyes look just like yours do, very painful, i missed work because it hurt so badly. i thought id just maybe try out the rescue cream, expecting it not to work because nothing ever helps, and within the first few uses i noticed a small difference, now about 4 days later, i notice a massive difference while my eyes still have that wrinkle and are a little flakey they are MUCH better!!!!! thank you SOOO MUCH! You're the only person on the internet I've been able to find whose eye eczema looks just like mine. I bought the Dr. Organic cream you recommended, and although it doesn't sting when I put it on (like everything else) I can't say that it's doing anything to clear up the problem, although I'm sure the moisture it offers is preventing it from getting worse. The skin around my eyes is just constantly shedding, and I know that it's probably not doing me any favours, but I have to rip all the dead skin off with sticky tape in the morning, that's how much there is. Oh I'm so sorry to hear :( How long have you been using the cream? It took me about a week before it fully cleared up. Keep applying it very thickly morning and night, and when you feel your skin drying out after, apply again. I even took my cream with me to work so I could put it on my eyelids throughout the day! I ran across your blog post in a desperate Google search for a solution to my eye eczema. Your pictures look identical to the way my eyes looked when I had flare ups, and even when I didn't have flare ups my eyelids were always red. I have tried TONS of steroid creams over the last several years and all they did was make my skin look wrinkly and scaly. Thanks to you, I have now been using Manuka Honey cream for 2 weeks (applying it 5-6 times a day), and my eyes are almost completely back to normal. The ugly redness is gone, the scaly "snake skin" is gone, and my eyes are no longer puffy when I wake up every morning. I can't thank you enough, you have saved my eyes!!! I would have never known about this product if it weren't for you, and it is a million times better than anything a dermatologist could ever prescribe for me. I absolutely swear by this product, it is amazing. Thank you so so so so much!!! Hi Mary. I used the purepotions skinsalvations which has worked for me. I have posted a little paragraph earlier but to summarise I feel instant relief when I apply the ointment in my affected areas. I tried steroid creams, that transparent lotion with red bottom, e45 and they all do nothing to calm my eczema. Have recently developed redness and very dry patches under just one eye and both eyelids..I am off today to buy the honey cream so fingers crossed..
Amazing blog. I found it very interesting. Keep sharing. After a ruined NYE i searched the internet yesterday for a miracle cure for my hideous eyes! (New yr, new me all that!) and i found your blog! I went straight out yest to buy the manuka honey cream and OMG......over night my eczema has vanished!!!! I literally cant thank you enough! Thank you, thank you!!! I wish you all the good health in the world!!! Just wanted to put out there that I recently found out that a skin allergy to a hair dye is probably what caused my eye eczema. I had a patch test done at a dermatologist office and I haven't had eye eczema in 6 months!! Hi, wanted to say thanks for writing this and posting photos of what your eyes look like (they look the same as mine). I'm 35 and for the past 5 months my eyes have progressively become worse till I couldn't sleep last night because they are so red, puffy and itchy. I was desperately googling when I found this. Starting with creams and having an elegy test done. Marti. Thank you for posting this. I got eczema on my eyelids. My dermatologist recommended me to use Cetaphil Ultra Hydrating Lotion. It works. My skin is okay in the last three months, but eczema flare up now. I gonna try Manuka Honey Rescue Cream. I hope it works for me. Thank you so much for posting this. I also have very bad eczema round my eyes , they are red raw and extremely dry, I have tried countless creams and I have just purchased this from Holland and Barrett now. Fingers crossed it works for me too. Thanks ever so much for this post - I feel relieved not to be alone with this issue. My eyes look EXACTLY the same as yours each spring/fall. I've also been diagnosed with mold allergy, which first occurred when I moved to more humid climate than I'd been generally used to. The only thing that works for me is hydrocortisone but I am always concerned about its side effects. It's also not supposed to be used on the eyes. For example, my eyes tend to get very sensitive to light after using it. So i'll definitely try the cream you recommended -really hope it'll work. Also, my best friend has terrible eczema all over her body and she uses Aveeno products, e.g. lotion, shower gel etc. It might work for others, too. Hi, I have been suffering with this same issue on my eyes too for some months. After not wearing nail polish for months, I put some on last night and tonight, my symptoms are coming back. I did some searches and it turns out this is a common allergic reaction to nail polish. I tried the manuka cream after reading this blog and the Dr Organics range is excellent. I wanted to post about the nail polish so your readers can see if this is their issue too. Has your condition got better? I found this post about a week ago and I just wanted to thank you so much for your reccomendation on that Manuka Honey Cream which I purchased just last week a day after finding this post. I have pretty much had eczema since being a baby and have gone through stages of varying severity. As a young woman it is can be really difficult to deal with because it is such as aesethically driven issue to have to deal with. Recently I began flaring on my face and around my eyes just as you did and that is particularlry upsetting because as a makeup and beauty lover it is so demotivating to have to see your skin looking so bad. Thank you so incredibly much for sharing! You have told my life story! Just finished up steroid treatment and it's already back. Not liking using hydrocortisone on this area, but needing relief. I'm ordering this today. Tired of wasting money on product after product. Thanks!! After spending loads of money on doctors and specialists and applying steroid creams etc - I finally researched and approached fixing the problem myself. I've removed wheat gluten, soy and sulphides from my diet and the eczema has cleared up. If I accidentally ingest one of these triggers I find that organic coconut oil is best for treating the reaction (provided there is no secondry infection). Hope this helps. Hi! I also have eczema on my eyes. I bought the rescue cream that you suggested. When I put it on it stings a little. Do you feel like that when you put it on? Also, the skin that has eczema turns red, but not any other parts. Ugh, I can relate to this! After a lifetime of eczema on my legs and arms, it spread to my eye area this last spring. At first I thought it was seasonal allergies, or something I've been eating but months later I'm still dealing with red & wrinkly skin. I had to stop using YSL Touche Eclat as that seems to irritate my skin. It seems to go in cycles of looking healthy then turning red, flaking, healing and then the whole thing starts over again. I've found that argan oil has helped quite a bit. I will be trying the cream you recommended. Thank you so much for posting, it's good to know I'm not alone! Thank you so much for posting this, I had to read it all and unfortunately your in depth blog post has made me want to post an in depth comment..
You're story sounds exactly like mine, timeline of eczema and the same eczema places. I've had eczema (and asthma and hayfever) since I was born, apparently I had to wear mittens when I was baby because I scratched my wrists so much that they bled. E45 never worked, anything Jonstons related made it worst (which annoyed my midwife mother, she was the 1/10 midwifes who didn't recommend it), I just had baths with melted emulsifying ointment, eumavate on bad places and was lathered in ointment afterwards. I don't have to be constantly covered in ointment any more but the only moisturiser I can use is Palmers Coco Butter . When I was 14 I developed oral allergy syndrome (cherries, apples, stone fruits and some nuts make me near alaphatic shock - but only when raw..) and in mid-May, when I was 15, I suddenly developed a massive allergic reaction that affected the skin around my mouth and nose that ended up with swelling around my neck. After a week of every over the counter/prescription cream with no result, I ended up on high dose steroids and a diet of water and eggs (with no seasoning). Since I was 15, I had the same mouth/nose/neck swelling every year around May/June and would always end up on steroids and a restricted diet because there was no trigger. Since moving to London two years ago, I haven't had that allergic reaction, but at the same time of year, I have giant, swelled up, red panda eyes that I can pretty much peel away skin from - I worked in a restaurant last year, my manager agreed to let me have a week off because they were so bad (plus steroids make me a bit out of it..). The reason I've been brought to your blog is that I've suddenly developed it for the second time this year. Like you, when the panda eyes came on two years ago, I googled as many creams as I could and I found the Dr Organic manuka rescue cream the absolute best. Yeah I spent a week doing a lot more make up than normal and my face felt a bit greasy but I didnt need steroids.. but this second wave hasn't responded to Palmers, Vaseline or Dr Organic, they all have made my eyes less dry so make up doesn't look like scales. But they all sting to put on and our gone within minutes so I layer it which ends up in my eyes - that stings more.. I take fexofendine everyday so I have no idea how my body is managing to produce eczema when I'm full of anti-histamines and having nice organic products put on it. I haven't tried the Eh products but are they worth investing in, having invested in the other products? Hello Ruth, I had a pretty bad bout of eczema flare up a couple of years ago I had flakes of dry skin that peeled off around my eye. I was given steroid creams which helped a bit, but I found out purepotions. It usually soothed my bad flare ups. However it stopped working for me. The I moved onto lipobase, which has been the best solution for me. I have also tried Lux's recommendation of Dr. Organic cream which doesn't work for me. I'm 16 years old and reading that im not alone with this is amazing! I was wondering has anyone else found they couldn't open their eyes in the morning? I have had to physically open my eyes with my fingers ( I don't really know how to explain it)? Sorry that was so long and kinda turned into a rant, thanks again and good luck everyone! The manuka honey cream from dr organic is the only thing that works for me to. Is really amazing! And it is a natural/vegan brand non tested in animals. the manuka honey cream from dr organic is the only thing that work for me to. It is really amazing. I normally use the hand cream, but I believe that the rescue cream you show works the same way. To everyone that have this problem, I really encourage you to try. Plus, it's natural, vegan and non tested in animals... And it's not very expensive. Thank you so much for your post and for sharing your story with us! It is incredibly courageous of you to share your experience, humiliating as it may have been. I've had eczema on my hands and joints since infancy, but it vastly improved as I entered adulthood. I moved to New York from the west coast two years ago. The first year I was fine. Last year, I woke up one morning with swollen red eyes and eczema around both of my eyes. This had never happened to me before. After seeing numerous dermatologists and allergists, and undergoing allergy testing, I found out that I was allergic to pollen (as well as dust mites and cockroaches...ewww). I was prescribed an incredibly expensive prescription steroid free cream ($200) to use around my eyes; after using it for the past year, I have seen no results. If anything, the fumes the cream gives off only make my eyes sting like crazy. I also started allergy shots and am using antihistamine eyedrops to no avail. My mum also bought me 100% silk sheets in hopes that they would help...nope! I had an eczema free summer...but the eczema flared up again once the summer humidity ceased. This fall the ecezma is concentrated around my right eye, and my right eye only. I look 1/4 zombie. The eczema is red, raised, and bumpy. I have ordered three jars of Dr. Manuka Honey Rescue Cream and am going to cross my fingers that it works for me as well as it has worked for you. My friend's wedding is in 3 weeks...and I'm a bridesmaid. :-( I'll let you know how it works! Thank you for your blog post! I had no idea what was going on with my eyelids and because one of the doctors at my doctor's office is on maternity leave, I have to wait until November for an appointment. I didn't know what to look up to find out what's going on, so I just typed in "dry flaky skin around eyes" and looked at the images to find something similar. Thank you for posting the pictures and videos!! I am so glad to know that it's nothing too serious! I noticed that makeup makes it worse, but didn't know why. I tried moisturizer and lotions, some would start to help and then it would get worse. My daughters have eczema and a friend recently sent us some melaluca products for it, so maybe I'll be able to use something from there to help, but I am so grateful for all of the information you have given!!! I will have to look into some new products!! Thank you so much!!! I realllllyyy want to find this product in Canada! but I don't want to buy it online.. does anyone know where I can get this?! I would really like to try this product!! I've been suffering from the same thing since I was a kid and it looks like our symptoms are the same. do you know where I can buy this in Canada?? I would rather not go online. I have suffered from eczema on and off most of my life (im 33 now)when I was younger it hit spots like my elbows and strangely on my scalp but as an adult it now targets the inside of my thighs and most recently like you a super annyoing under and over eye patch which has never happened before. It tends to be super super itchy and although I try not to scratch I do and then it stings and goes very dry and scaly. Ive had this one patch for about 2 months now and I dont think the warmer winter is doing much to help as I find it gets more itchy when I am hot on my london commute each day. 2) winter allergy to something outside - what can you do about that though? I would be interested to know if anyone has made any headway looking into these internal factors? Frustratingly I have found doctors not much help at all when it comes to eczema as they just want to offer steroid based creams which off course I wont want to use under my eye!! It frustrates me that the allergy tests you can have are so expensive and doctors refuse to offer them when it could help to show anything I can avoid that is creating this issue. On positive I have a free phone call consultation tommorow with Sarah Hanratty - a Clinical Nutritionist at the Brain food clinic in Birmingham as was really encouraged by their blog anappleaday.org which has some interesting case studies on helping people with all sorts of health issues which could be cuased by outr diet, stress or lack of vital minrerals and vitamins in our body so hope she may be able to shed some light on my eczema. thank you so much this product has changed my life! I suffered from eyelid eczema for 6 months straight, itchy puffy and peeling for months straight. IVE TRIED EVERYTHING. This is the only product that helped. If you didnt make this blog i dont know what i would have done. THANK YOU THANK YOU THANK YOU XOXO!! !